Ever since its introduction, remote controlled car toys or RC cars have always been one of the most popular toys for toddlers. I think every generation of children after the introduction of the RC car owned one of these cool and fast mini vehicles. In this article, I will be giving you a list of the best remote controlled cars for 3 year olds. We will be basing this list on the level of enjoyment, the benefits they can offer, and their safety. Why Buy a Remote-Controlled Car for your 3-Year-Old? One of the earliest and most enjoyable toys that focus on full interactivity for toddlers is definitely the RC car. 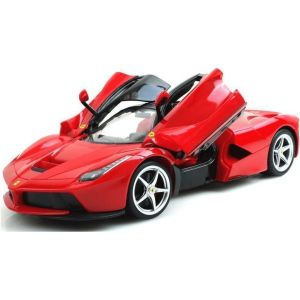 RC car has proven itself to break the boundaries of age as it has variations designed for older individuals. For toddlers though, the RC car is an exciting way to hone their motor skills and have them make quick decisions on the fly. It can also teach toddlers about cause and effect in an enjoyable way. RC cars offer hours upon hours of fun. But along with fun, it can also enhance and improve other attributes such as confidence, problem-solving, hand-eye coordination, creativity, cognitive skills, and even their socialization skills. An ideal RC car for toddlers should also offer a decent level of visual exercises. For example, pick an RC car that has bright colors. This should assist in sharpening their color recognition as well. As you can see, RC cars offer a multitude of ways to develop your child’s mind and does so in a unique and exciting way that other children’s toys simply cannot offer to this degree. Now, in order to help point you over to the right direction, I have compiled a list of the best remote-controlled cars for 3-year-olds. This list was compiled using several guidelines that we will also touch upon later in this article. Along with those guidelines, I have also taken into account their overall positive customer feedback as well as my, and my child’s, personal experience with some of these RC cars. Now then, start your engines and let’s get to it! Here are top 8 remote controlled cars for 3-year-olds. Affordable and you get 2 RC cars! Quite a deal if you ask me, especially if you have two toddlers at home. Design-wise, this RC car dual pack fits the bill for what is needed in a toy for a 3-year-old child. Big, smooth edges, uses bright eye-catching color and uses child-friendly characters on the driving seat as well. 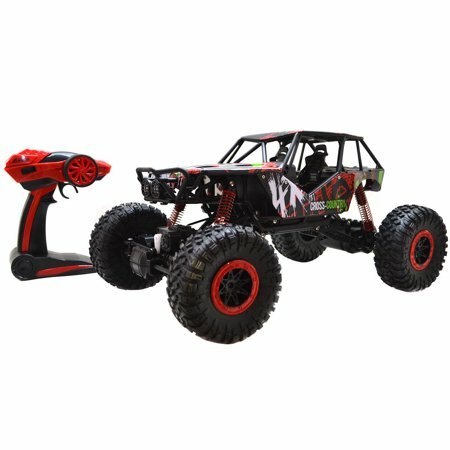 Both RC cars use specific controllers and utilize unique frequencies for each. This means your children won’t experience any control troubles if they decided to race their RC cars against each other. This is actually a common problem with certain remote-controlled cars. There are occasions wherein a brand will use a similar frequency for most of their RC cars making it impossible to play two simultaneously nearby each other. Not the case here. As for controlling the RC cars, it uses a simplified two-button control setup with one button to move forward and the other to turn. This is a perfect control scheme for a toddler. As an added bonus feature, the buttons produce music whenever pressed. Comes with two different RC cars. The music constantly plays and can be a little annoying for adults. Turning requires at least a 2 to 3 feet clearance. Not designed to be played indoors due to its turning radius. The Liberty Imports Cartoon RC Race Car follows the same aesthetics as the previous entry in this list. It is brightly colored to better stimulate your child’s visuals, smooth and rounded edges to prevent injuries and is quite durable. 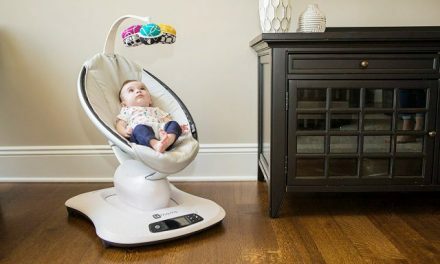 It also comes with 3 different ‘drivers’ that your child can switch around. The remote control is quite easy and is designed for the younger set with its 2-button control layout. One button makes the RC car move forward while the other button makes it turn left. Other than the RC controls, there are also additional buttons on the controller. These buttons produce different sounds like the engine revving up, honking, and music. 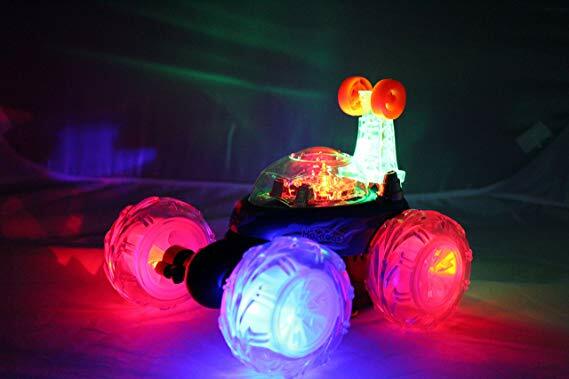 The RC car also has actual flashing headlights which can help stimulate your child’s cognitive capabilities. This remote-controlled car requires 3 AAA batteries while the remote control will need 2 AA batteries to operate. Overall, Liberty Import Cartoon RC Race Car offers a kid-friendly RC car toy that checks out all the boxes of a quality RC toy for younger audiences. Simple, easy, and intuitive controls. Interchangeable drivers for your kid to play around with. Has difficulty moving over the carpet. It can be quite loud with music and sound effects constantly playing. In terms of speed, it is quite underwhelming but is probably perfect for toddlers. This is definitely a favorite of my toddler thanks to its extremely snazzy and eye-catching design. The Turbo Twister HAK101 is designed to withstand the rough and tumble playstyle of a toddler with its 3-point axle system which allows it to move downside up and upside down. It also has a child-friendly autocorrect system that returns it to an upright position whenever it flips around. One of its biggest selling points is its myriad of LED lights located within all 4 wheels and inside the driver seat. The flashing lights will definitely add to your child’s enjoyment. The HAK101 Turbo Twister RC Car uses rechargeable batteries which can save you cash in the long run. I highly recommend this RC car for toddlers who are too old for the overly simple RC cars but not old enough to play with the extremely fast stunt RC cars yet. In terms of being a visually stimulating toy, the HAK101 is a great choice. This child-friendly stunt car is quite sturdy. It is designed for spinning and jumping off small ramps. This is a great RC car for developing your child’s creativity and imagination as well as their hand-eye coordination. A good introductory stunt RC car as it can spin, be driven upside down, and on its two rear wheels. Bright LED lights help keep your child’s attention. Can drive well over carpeted floors. Can quickly empty if all features are constantly used requiring regular charging. Some complaints about several screws missing in the package. You might think this RC toy might not be appropriate for toddlers of age 3 but you cannot be farther from the truth. The simple yet intuitive controls offer hours upon hours of enjoyment for younger toddlers and it can also be a good way to introduce history to your child. The BlueFit RC German Tiger I Panzer Tank is designed to be as close to the real deal in terms of appearance. The level of detail is quite amazing and this tank is compact enough if you wish to put it in a display case in the future. 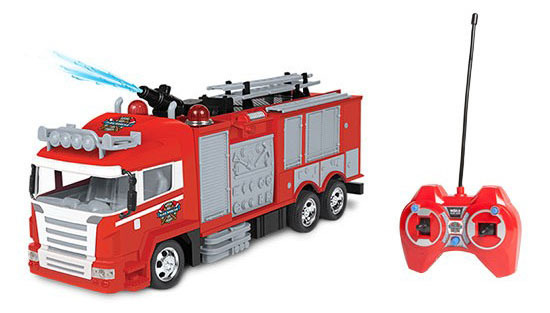 While this RC toy does include details to make appear as though it is designed for older kids, it comes with features and design choices that firmly puts it within the toddler age bracket of 3 and up. 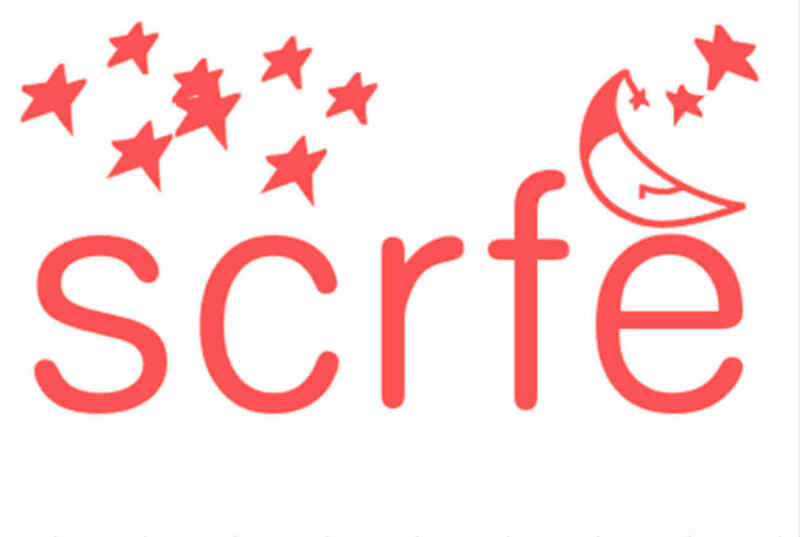 The overall design keeps important factors in places such as its focus on developing and encouraging creativity and use of imagination. As you expect, an RC toy tank differs with the standard RC race car. The BlueFit Panzer I Tank features a rotating turret that can also simulate the recoil as if it was actually fired. A nice touch that enhances its realistic approach. As for the speed of this RC tank, it offers a second gear that increases overall speed. The engine sound produced by this toy also captures real deal. 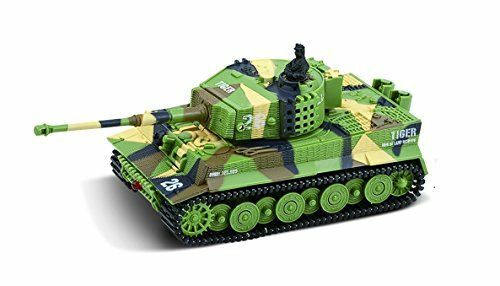 The fact that this RC toy tank is impeccably designed makes it an ideal toy for children between ages 3 and 8. It is also detailed enough to be used as a display once your child has grown out of it. Toddlers will greatly benefit from this RC toy tank in both enjoyments and as a viable history/educational toy as well. It can also pique their interest in engineering and further expand on their inquisitive nature. As they grow older, you can further give them a more in-depth history lesson attached to this legendary war tank. Fast and mobile RC toy. Can be a great educational toy. Really compact design and can easily slip under sofas and cabinet. It is surprisingly fast. Too fast, even. If you want to give your kid an RC car toy with a twist and encourages outdoor play, the Kid Galaxy RC Car Amphibious series might just be the one you are looking for. It comes in a variety of designs from crocodile to turtle themed ones. This is an RC car specifically designed for use in the outdoors. The wheels generate enough traction to drive over pavement, dirt, grass, sand, and even water, hence, the ‘amphibious’ tag on its name. Controls are not as simple as the two-button setup but are still easy enough to learn for toddlers. Control scheme uses the classic RC layout of two levers. Pushing both levers forward will make the Kid Galaxy RC move forward, pull both levers back will put the RC car on the reverse. Turning is done by simply pushing one lever forward. For example, pushing the left lever forward will make the RC turn left. Pretty simple and manageable for a toddler after a few practices. I do have some complaints about this product. The fact that it uses 9v batteries is surprising as most RC cars today utilizes AA and AAA batteries. 9v batteries are actually not as common today so you might need to check specific electronics stores to get one. All in all, the Kid Galaxy Amphibious RC Car offers a unique feature that most RC cars do not have, and that is its all-terrain design. It has a decent speed over all types of terrain, an appealing kid-friendly design, and a simple yet challenging control which will help improve your child’s hand-eye coordination. All-terrain RC car designed for outdoor play. You can’t use all 4 variations at the same time as two always seem to have the same frequency. If your child loves Thomas the Tank Engine then this will be a perfect RC car toy for them. Design-wise, this is as child-friendly as they come. It is also relatively larger. Combine this with Thomas’ bright colors and you have yourself a visually stimulating toy for toddlers that also offer a level of familiarity for fans of this sentient train. As for controls, it uses the simple two-button control layout. One button to move forward and another to reverse and turn. Toddlers will also enjoy a nifty feature that allows for ‘steam’ to puff out of Thomas’ chimney. This is not hot and is perfectly safe to touch. You will need to fill the reservoir with the right amount of water to get this steam effect. A nice touch that will enhance the toddler’s enjoyment. This RC train toy also features several sound effects; from train whistles to quotes from Thomas himself. I highly recommend this RC car toy for those who want to give their child a friendly and familiar face to play with. I do need to warn parents not to overfill the reservoir as it might cause leakage. You also have to be aware that children can sometimes be quite reckless when playing. I suggest you let them play with this RC Thomas the Train on protected surfaces and away from any electrical cords or sockets. I had my kid play this in our garage to prevent any accidents caused by the water spills. Cleaning this RC is, fortunately, extremely easy and drying the water container can be done within a couple of seconds. 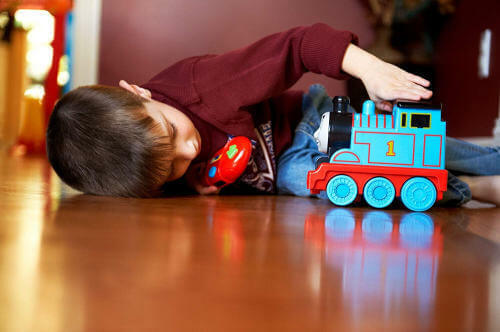 Overall, Fisher-Price Thomas & Friends Steam N’s Speed RC is a great choice for toddlers. It is a good introductory RC toy but just be aware that it is susceptible to water leakage. Uses Thomas the Tank design. Comes with a “steam” feature for added realism. Simple controls are perfect for first-time toddlers. Also utilizes multiple sound effects and quotes from the popular children’s TV series. High chance of water leakage. Not as durable as you would hope for a child’s toy. 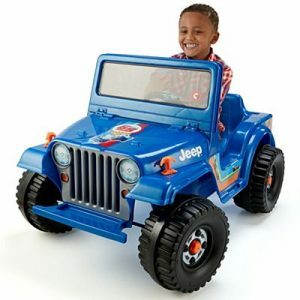 Little Tikes’ introduces a new and unique twist to the traditional RC toy car. The Tire Twister features a giant wheel where you put the RC toy car in. Using simple and easy to grasp controls, your toddler can move the giant wheel around. It is also surprisingly mobile and maneuverable. 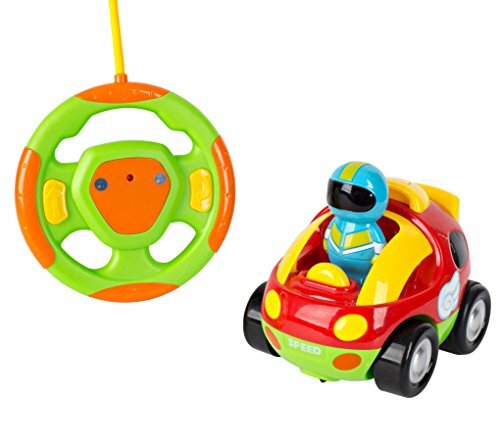 This offers a wide variety of stunts for your child to experiment with as he can flip the RC car inside the wheel, flip it outside, and have it jump over small ramps. The wheel can also do a 360-degree tailspin and is guaranteed to provide hours of fun and experimentation for your child. As you would expect, the Tire Twister is well-built and can withstand smashing around the floor and wall. Your child can also opt to just play with the toy car itself. The toy car is designed so that your child can control it even if it flips upside down. It also has blinking LED lights which provide a cool looking effect. 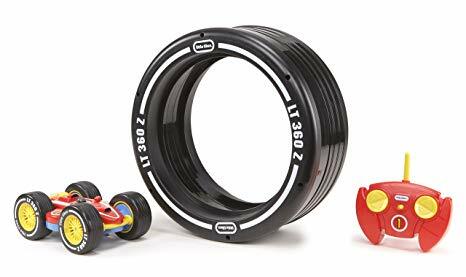 The Little Tikes Tire Twister is a perfect RC car toy for toddlers who want to fully experiment with maneuvering their RC car toy. In terms of mobility, this one fully blows the rest of the competition out of the water. Basically, the Tire Twister is specifically designed to fully hone your toddler’s hand-eye coordination and their cognitive skills. It also encourages creativity with its flexibility. Extremely maneuverable but maintaining simple controls. Great stunt RC car for toddlers. Features flashing LED lights that simulate police lights. The fairly loud banging sound when it flips around. No volume control to turn down the siren sound effect. A large ad hulking RC toy car that captures the look and feel of a monster truck. The Maisto RC Rock Crawler is an all-terrain RC car designed for toddlers. It features TPE tires and suspension which gives it exceptional traction over uneven terrain. It also utilizes three different motors that provide it that extra boost when traversing rough terrain. Two motors handle the driving aspect with one motor specifically used for steering. 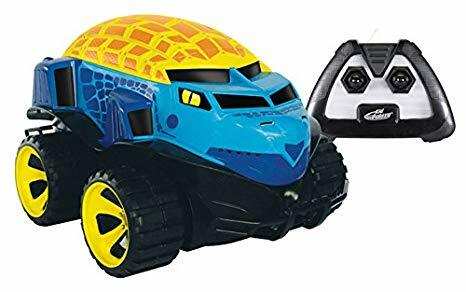 While it appears quite large and bulky, the Maisto RC Rock Crawler is surprisingly lightweight and can be easily carried by toddlers. Durability is also touched upon with the vac-formed body that provides enhanced toughness. One special feature that the Maisto RC Rock Crawler provides is the tri-channel transmitter. This transmitter allows two other Maisto RC users to race with you without hindering the controls due to having similar frequencies. The remote control and the RC car use 3 AAA and6 AA batteries respectively. For toddlers who want an added challenge to RC racing, the Maisto RC Rock Crawler is a good alternative. It is a beginner’s all-terrain RC car and is designed to be controlled easily by toddlers who are still learning the ropes and experimenting with cause and effect. The Maisto RC Rock Crawler is all about torque power. If you truly want your toddler to make the most out of this RC car then I highly recommend you bring them outdoors with somewhat uneven terrain. It is well-made and designed to withstand the punishment synonymous with off-road racing. It uses a removable rechargeable battery that you can switch with a more powerful mAh battery if you wish. Lightweight controller and RC car make it easy for toddlers to handle. It has problems making sharp turns. 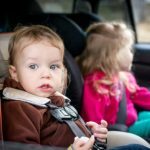 What to Look for in Remote Controlled Cars for 3-Year-Olds? Choosing the best RC toy car for your toddler is actually quite simple and not as complicated as you might expect. I will be running down a few aspects you should look for when choosing the best and safest RC car for your child to get you started in the right direction. One of the great things about the internet is that the information you need is just a few keystrokes away. Make sure you choose RC cars made by reputable manufacturers. Found an RC car online? Check the manufacturer’s customer feedback and Better Business Bureau rating (BBB). One of the best ways to determine the quality of the RC car toy is to check reviews from customers with verified purchase tags beside their names. You can get some nice insights by browsing through customer reviews from online shops like Amazon. Combine this with your own research and you will get an almost complete idea of what to expect with the product. Do not make the mistake that all RC car toys are designed for all ages. 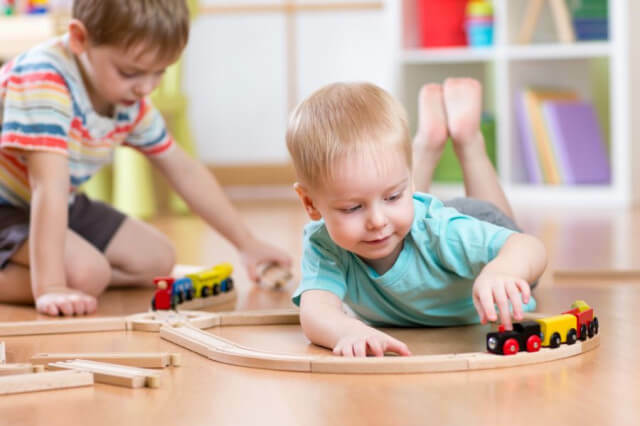 Toddlers will require a simpler and visually stimulating RC car toy but can also assist in developing cognitive skills, communication, hand-eye coordination, and problem-solving. Always check the age suitability of the toy first foremost. Some materials used in making toys, especially with extremely cheap ones, may contain dangerous chemicals like lead. For whatever children’s toy you choose, or any product, always pick one that has an ABS-free tag on it to ensure that the material is perfectly safe for your child. Battery Powered or Nitro-Fueled RC Car? There are two types of RC cars available in the market. For a child-friendly choice, always go for battery powered ones. They are far safer than nitro-fueled RC cars and are considerably easier to maintain and clean. Nitro-fueled RC cars are best left for adults and serious RC car enthusiasts. It is also quite loud and the risk of a nitro-fuel leak is a possibility. 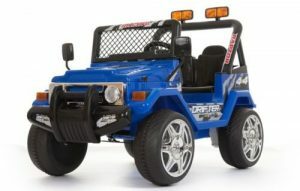 Compare to this battery powered RC cars that are quieter and are user-friendly in design and use. While battery-powered RC cars lack the consistent power and speed that nitro-fueled RC cars offer, this is a worthwhile trade for the optimum safety of your toddler. As you can see, RC toy cars not only offer hours of fun for your child it can also help develop their cognitive, hand-eye coordination, reflexes, and gross motor skills as well. This article will help you pick the best one for your toddler and remember that playing outdoors with your child is significantly better than letting them use their gadgets indoor for the entire day. NextThe 9 Best Twin Bed For Toddler : How to make the right choice! Baby not crawling at 10 months -the tips you should know! 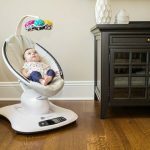 Mamaroo Vs Graco Glider: How To Pick The Right One For Your Baby ! 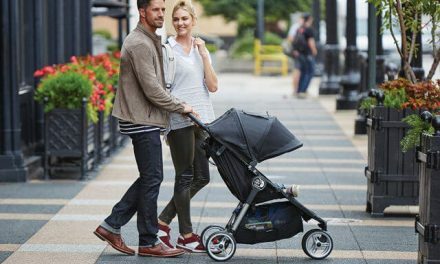 Britax B Agile VS City Mini – Which is the Best Lightweight Baby Stroller? I went over this site and I conceive you have a lot of wonderful info , saved to bookmarks (:. But I have a question, I see a lot of Items on this site http://bit.ly/CheaperProducts that you also sell. Britax Boulevard VS Marathon – How To Choose The Better One ? 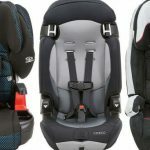 Graco Affix VS Turbobooster – Which is the Best Booster Seat for Kids? The 5 Best Night Lights for Nursery: Improve Your Baby’s Sleep Now!